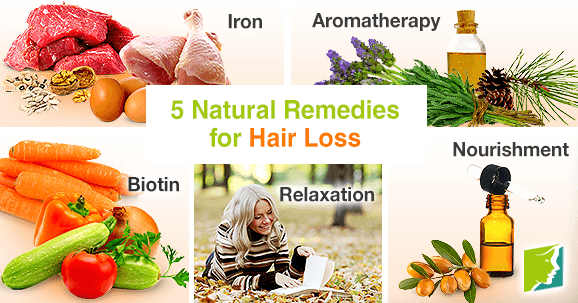 Hair falling out or becoming thin can be very distressing. There are many things that make a woman beautiful - inside and out - and hair is not essential to that. Nonetheless, lots of women define their image, femininity, and sexuality by their healthy hair, and losing this can trigger feelings of insecurity or low self-confidence. Unfortunately, hair loss is a part of the aging process. Women are likely to notice less hair around the crown and base of their scalps as they approach menopause, but there are remedies that can minimize this. It's a good idea to increase your intake of poultry, fish, nuts, and legumes to reduce hair loss, as these are all great sources of iron. Iron's primary function in the body is to act as a carrier of oxygen in the blood, improving circulation to the scalp and stimulating hair growth. Pairing your iron consumption with vitamin C sources, like citrus fruits, will help maximize its absorption. Gently massaging the scalp could have a stimulating effect on hair growth, but this can be maximized through the use of specific essential oils. Lavender, cedarwood, and rosemary oils can boost hair growth; mix six drops of one of these with one tablespoon of a carrier oil, such as jojoba or grapeseed, and massage into the scalp using your fingertips. Biotin is a vitamin that is necessary for proper hair growth and color, found in egg yolks, legumes, and nuts. Increasing your consumption of these foods could help counteract the effects of hair loss if you are experiencing a biotin deficiency. Stress can cause hair to fall out, and, problematically, hair falling out can also be a source of stress. This creates a vicious cycle of stress and hair loss that can only be broken once you have discovered an effective way of relaxing. Take thirty minutes out of your day - every day - to do something that helps you to unwind. Do whatever brings you pleasure; this could mean enjoying a long bath, going for a run, curling up with a book, or meditating. While you are worrying about hair that has fallen out, it is important to remember to care for your remaining hair, too. Avoid tight styles, as they can exacerbate hair loss. Harsh treatments, such as bleaching or heat-styling, can also dry out your hair, making it brittle and more prone to breakages. Try using a few drops of argan oil or coconut oil after washing your hair, as these have high quantities of vitamin E, which can penetrate hair follicles and rehydrate them to add shine. As shocking as it may be to notice the beginning of hair loss, remember that there are ways of treating and disguising this, and total or near-baldness in women is extremely rare. Try not to let thinning hair make you feel any less womanly; the things that make you feminine and beautiful are so much more than the amount of hair on your head. Focus on caring for the hair that is there and maximizing other aspects of your appearance to help with your self-image and boost your confidence. Hair loss can be a deeply upsetting problem in a woman's life and greatly affect her self-esteem. Learn more about the different aspects of this problem. Although not as common as hot flashes, hair loss is also linked to menopause. Click here to learn about treatments. Hair loss caused by menopause can be an upsetting experience that jeopardizes your self-image. Keep reading to learn how to cope with hair loss.